Today, we're going to make a popular side dish which is easy-to-make and can be used in different ways. My kids just love this popular Israeli preparation. There's a lot of scope for experimentation with this recipe though nothing can beat the authentic version. You can keep it for up to a day in a refrigerated form. I often use it in salad and sometimes mix it will pie stuffing. It's a nutritious serving one can include in a breakfast too. Try this recipe as part of the filling in tacos and see the difference. I love to squeeze extra lime juice on top before serving. There's no substitute for couscous and one should skip the preparation altogether if it's not available in your local supermarket. Let's quickly make this recipe. 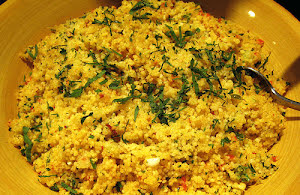 Do once try this popular, fulfilling, and delicious couscous recipe of Israeli origin which can be quickly prepared with select and fresh ingredients. Boil 4 cups of water with a tsp of olive oil in a sauce pan. As soon as the water starts boiling, bring it down from the flame. Immediately add couscous and salt in it. Give it a good and gentle stir. Close the sauce pan with a lid and keep aside for 10 to 12 minutes. Drain the water (if any) and transfer the cooked couscous to a large bowl. Gently break it with a fork to get a fluffy texture. Add finely chopped white onions, finely chopped cherry tomatoes, finely chopped cucumber, remaining extra virgin olive oil, lemon juice, and parsley to the bowl. Gently fold in and combine all the ingredients with couscous. Finish with a seasoning of ground pepper and kosher salt.